Energy plays a critical role in the functioning of modern economies. At the same time, it’s at the heart of many of today’s pressing environmental concerns—from global warming (predicted to reach around 3–4 degrees Celsius by the end of the century) and outdoor air pollution (causing over three million premature deaths a year) to traffic gridlock in urban centers. In a new IMF book, we look at precisely how policymakers can strike the right balance between the substantial economic benefits of energy use and its harmful environmental side effects. These environmental impacts have macroeconomic implications, and with its expertise in tax design and administration, the IMF can offer sound advice on how energy tax systems can be designed to ensure energy prices fully reflect adverse environmental impacts. We do this by developing a sensible and reasonably simple way to quantify environmental damages and applying it, in over 150 countries, to show what these environmental damages are likely to imply for efficient taxes on coal, natural gas, gasoline, and road diesel. For example, the human health damages from air pollution are calculated by estimating how many people are exposed to power plant and vehicle emissions in different countries and how this exposure increases the risk of various (e.g., heart and lung) diseases. Although there are some inescapable controversies in this approach (e.g., concerning the valuation of global warming damages or how people in different countries value health risks), the methodology is flexible enough to easily accommodate alternative viewpoints—it is a starting point for debate, not a final point of arrival. The world’s finance ministers should recognize they have some fairly potent tools at their disposal. Let’s face it, taxes can be a powerful way to point consumers and firms away from certain products—look at what’s happened with cigarettes in many countries over the past 50 years. Environmental taxes or similar pricing instruments can help in “getting prices right,” that is, reflecting environmental side effects in energy prices. We need to focus on smarter taxes, not higher taxes. If properly targeted at the source of environmental harm, these instruments provide the most effective way to reduce the harmful side effects of energy consumption. And their revenues allow governments to lower other burdensome taxes, or meet fiscal objectives more efficiently, thereby achieving better environmental and health outcomes while limiting any adverse impact on macroeconomic performance. In short, countries need not wait on international action to move ahead with energy price reforms, given the large domestic environmental and fiscal benefits. Finance ministers have a central role to play in all this, both in administration, and in restructuring the tax system away from taxes that are likely to be most harmful for efficiency and growth, such as income taxes, in favor of carefully designed energy taxes. But we need to pay careful attention to what should be taxed (the “tax base”) and how much should be paid via tax rates. As for tax bases, although there are different options, carbon emissions are most easily priced through levies on fossil fuel suppliers in proportion to the fuel’s carbon content, building off existing motor fuel taxes. Similar charges on fuel supply can be levied for local air pollution, though providing credits or refunds for capturing emissions—as sulfur dioxide “scrubbing” technologies do at power plants—is important, because it is net emissions released into the atmosphere that matter for environmental damages. For motor vehicles, charges on kilometers driven (varying with different urban road classes and time of day) can most effectively reduce congestion, and should be feasible for the longer term—but a reasonable interim step is to reflect all harmful environmental effects (most importantly: carbon, pollution, congestion, and accident risks drivers pose for other road users) in fuel taxes. As regards tax rates, these need to be set in line with environmental damages, to provide an automatic gatekeeper, ensuring that only those environmental improvements are made for which the benefits exceed the costs. A robust finding in the book is that fuels are pervasively, and substantially, under-taxed. But the degree of undercharging varies considerably across countries. 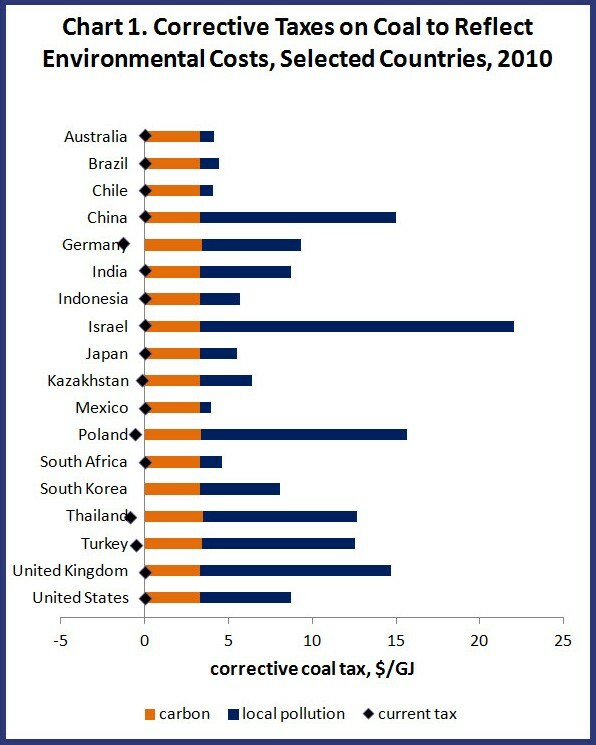 Take coal, for example, which is essentially untaxed at present, but for which carbon charges shown in Chart 1 amount to $3.3 per gigajoule of energy (about two-thirds of the average world price) while air pollution damages (despite regulations) exceed $10 per gigajoule in countries like China and Poland (with high population exposure to pollution), but are less than $1 per gigajoule in Australia and Chile (where the converse applies). Corrective taxes on gasoline are also substantial across advanced, emerging, and developing countries, but more to reflect the costs of congestion and accidents than air pollution and carbon emissions. There is much at stake here—implementing corrective fossil fuel taxes (relative to the current situation) would generate an estimated reduction in global carbon emissions of 23 percent, save 63 percent of fossil fuel pollution deaths, and provide fiscal benefits averaging 2.6 percent of countries’ gross domestic product.